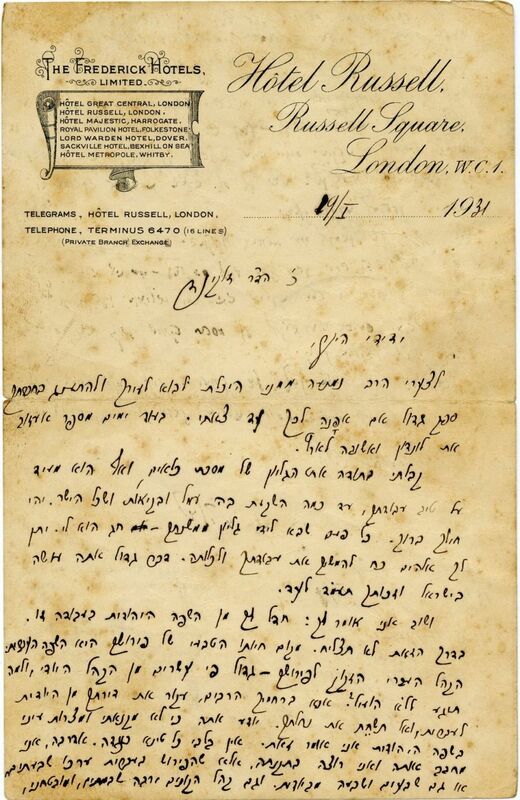 Bidspirit auction | Letter from Chaim Nachman Bialik. Letter on the stationery of the Frederick Hotel in London from January 19th, 1931, addressed to his friend Dr. Zilkind, in which Bialik implores him to write his commentary on Tractate Kilaim specifically in the Hebrew language. Bialik informs him that 'in a number of days I will leave London and return to the Land of Israel.' Dr. Zelkind arranged a commentary on Tractate Kilaim in Yiddish, and sent a sheet to Bialik to review and examine, apparently before it was printed. Bialik compliments Zelkind: "Each time a sheet from your mishnah arrives, it is a holiday for me ... you are doing a great thing for the Jewish people, and your merit will stand by you forever." He disagrees strongly, however, with the fact that Zelkind wrote his commentary in Yiddish. Bialik was of the opinion that the commentary should be written in Hebrew for a number of reasons: "The Hebrew audience who needs your commentary is twenty times greater than the Yiddish audience, so why should you work for nothing? "Please, with your abundant mercy, uproot your dwelling from the Yiddish to the Hebrew ... you know that it is not from my jealousy nor my envy for the Hebrew Language that I say this. I have nothing against it, on the contrary I love it and I want it to be regulated, it's just that the Hebrew commentary is worth sevenfold or even seventy-sevenfold more than the Yiddish, and the buyers are sevenfold more, and I am certain that the Hebrew will accelerate the complete of your work ..."
 official hotel stationery. 12x18 cm. Fold mark. Stains. Fine condition.